Will you know when it’s your last surf trip? Will you know before you book your flight? Before you commit to the week in Baja? While packing? Unpacking your boards at your destination anxious to paddle out to get the travel grime off and just get wet? While standing at water’s edge thinking twice about paddling out? While sitting out the back worried a bit too much about getting caught inside? While getting caught inside? During the trip back? While waiting for your boards in oversized luggage? While sharing hugs and good-byes? Or when you opt out of the next one? How will you know you took your last surf trip? It seems like yesterday, but it’s now nearly 10 years ago that my best friend took his last surf trip. I didn’t know it was his last trip and neither did he. It was my birthday. I headed to Baja for one of our traditional “gentleman’s” trip (as if any foray into Baja could include the term “gentleman”) to celebrate a milestone birthday – alone. None of my usual surf travel partners could or would make it – it was the middle of a Baja crime panic, plus everyone was getting older and, well, busy. So I headed down alone, threatening to send pictures if the waves were good. I didn’t mind. As the years piled up I had grown accustomed to taking surf trips on my own. Scheduling had become more difficult for everyone. Life was doing its thing. It was late September, so good south swells and conditions were pretty much guaranteed, and I knew I could create anxiety with my buds, if I wanted – especially my best friend who I had surfed with my whole surfing life – by texting shots of the lineup with captions about warm water (for Baja). All the while I would be reflecting on my own mortality. The latter being what we do on every birthday after #39. The surf was great, as expected. The winds were lighter than usual. And the crowd wasn’t there, which is one of the benefits of September surf travel everywhere. As much as I wanted to share this with friends, I knew there was only one who really mattered, so my only texts were to Arn. If anyone would jump on this, it would be the guy I learned to surf with, who had never backed out of a surf trip, and nary a wave, for that matter. Arn charged harder than anyone I’ve ever known. The only reason Arn wasn’t with me already was that he was recovering from a board to the head (not his, he was a Huntington local) suffered a few weeks prior that was nearly healed. Arn and I learned to surf at the Huntington Cliffs, moved away from home to Newport as soon as we finished high school, and went on our first surf trip together – Baja, of course. Later, while I was schooling in Florida, Arn shaped me a mushy-wave board and signed it “Arnold the Jap”. 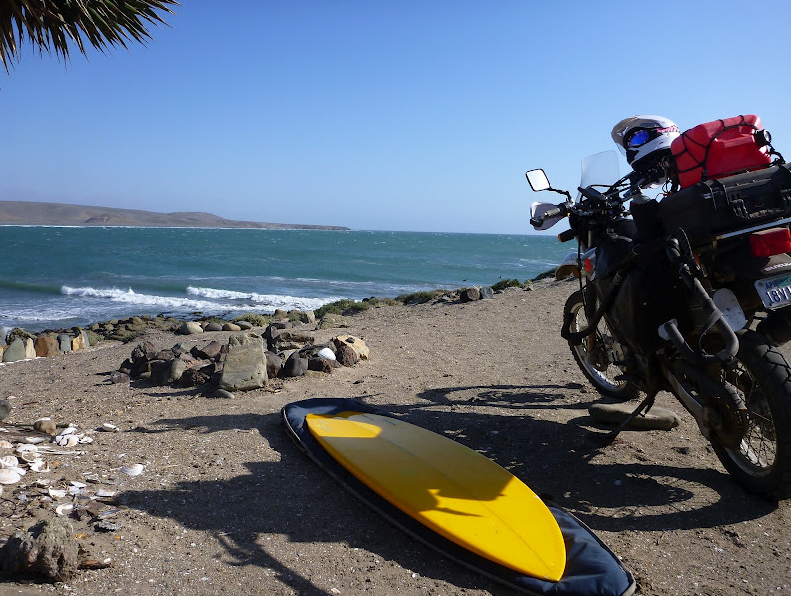 We did motorcycle and ski trips while I was living in DC missing a lot of surf, and whenever business brought me home to CA Arn would meet me at the airport with a board and wetsuit. If anyone was going to jump on this opportunity, it would be my best friend, Arnold. So one look at the video of K-38 that I texted and he was on his way for a quick, 3-day weekend of early fall Baja. This wasn’t a tequila-drenched Baja debauchery weekend. It was just surf, eat, rest, surf, eat, rest. Stay in nice, comfortable condos overlooking the surf. Hot showers, cold beers and best friends hanging out. My birthday fell on a Monday, the same day the stock market crashed signaling the beginning of the Great Recession. Arn and I were eating our second breakfast after our first surf that day while watching our life savings dwindle to practically nothing on CNBC. That sucked. But the surf was still good, so we went back out and put the stock market in its place. It would recover eventually, just like dwindling swells return. 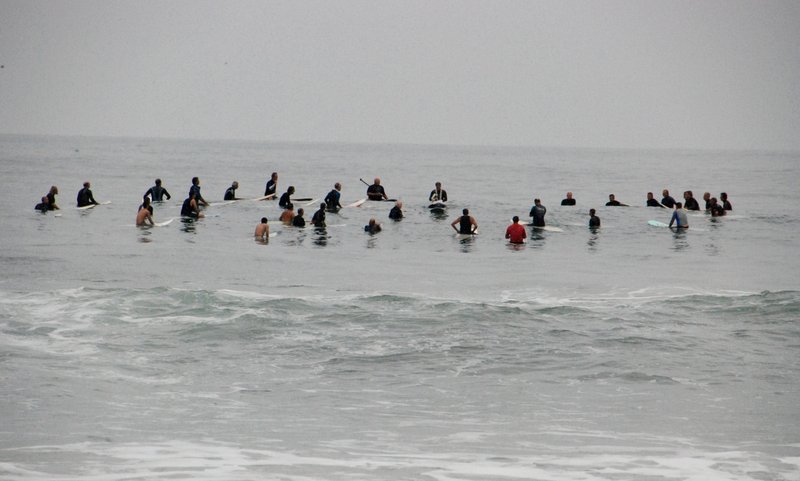 We couldn’t do anything about the stock market, but we could surf. It was Arn’s last surf, but neither of us had any clue of that as we dragged our happy-but-exhausted butts over the slippery rocks and up the cliff. He wasn’t feeling right as we got to the condo, not sure if it was still the head injury or the onset of the flu, but he knew something was up so he packed it in and headed home a day earlier than planned. He was pretty sure it was related to his head injury, but in the end, it wasn’t. A month later I got the call: “Mike, I have liver cancer.” I responded in the typical way that someone without cancer does. I was positive, proffered encouragement, “you’re gonna beat this, so-and-so did,” etc. But Arn, always the rational one, had the facts: You get liver cancer and you die. It takes months, not years, and it’s horrible. You deteriorate fast. We had a surf trip planned in a few weeks to enjoy our first stay at the new condo we bought together near Playa Colorados in Nicaragua, but Arn had to cancel, of course. He was about to knowingly paddle out into unsurfable surf. It was not a fun conversation, of course, but everyone has it sooner or later. And typically you will have more than one. What was most impactful and memorable was the last thing Arn said before he hung up the phone. I still think about what he said nearly every day, and I share this with every surfer I know. What he said was simple and pure. And so obvious that it hit me like a brick. Arn knew he had taken his last surf trip. I went ahead on our planned trip to Nicaragua, sans Arnold. The surf and conditions were incredible, which actually kind of sucked. A string of good south swells was in the water and the hard offshore winds were not as hard. There were hours and days of oil-like glass, something rarely seen in SW Nicaragua. I remember being out one overhead afternoon at Colorados. I counted six of us in the water – me, a young couple who would later become good friends (Seth and Lindsay) and three other older guys on Rusty Desert Island type boards. We were spread across about 75 yards and the lefts were the best I’ve ever seen there, before or since. And of course, all I could think about was Arn. Why is he missing this? He would so be pig-dogging these glassy barrels. When will he be back? Will he be back? Or did he already take his last surf trip? The days, weeks and months crept along painfully, especially for Arn. This bull of a man withered into what cannot be described. We spoke every few days, mostly about the business world and goings on with the Nicaragua properties, but always about his cancer’s progress. I tried to watch surf videos with him, but he didn’t want to. I tried to get him to go to the beach just to watch the ocean, but he wasn’t interested. He advised me to “surf more” and then he stopped, in every conceivable way. Eventually, the day came where he decided to turn around and paddle in. No more chemo or treatments. About six weeks later he passed. I was with him the day before. His sons and wife were at his side as he took that whitewater up the beach. Arnold never knew he was going on his last surf trip until it had passed. The media presents death to us as a long, going-to-sleep process with time and opportunity to say our farewells, wrap things up and pass away. It makes us think that we’ll have an opportunity to take that last trip or surf knowing what we’re doing and enjoying it for what it is. Dying is not like it’s seen on TV or the movies. And you probably know that. The surf media occasionally features really old guys still surfing. As groms, young adults, full adults and even middle-aged adults we sometimes wonder how long we will surf. But the answer is simple and always the same: “I’ll never stop surfing.” We expect to stay in shape, to keep surfing at the forefront, the #1 priority. Careers, relationships, and family responsibilities can all be managed so as to keep surfing no matter what. Sure, slowing down is inevitable, and challenging oneself with big waves will matter less, but I’ll still keep surfing. I’m a surfer. You are. But you won’t. It may slowly creep up on you or it may catch you by surprise, either by injury or disease, like Arn, but one day you will paddle out for the last time. The Ultimate Western Hemisphere Surf Vehicle? Is this the ultimate vehicle for a motorcycle-loving surf traveler? Is this ultimate western hemisphere surf travel vehicle? In some ways, yes. 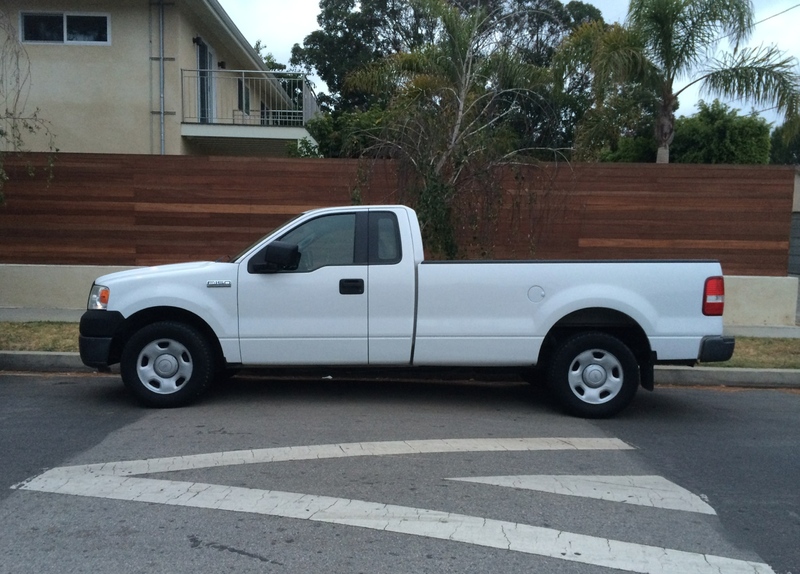 Cheap, used, high-freeway-miles Ford F150. Parts everywhere. Easy to work on, especially with 2wd and no power anything. Only 3 people fit in the cab – 2, really. And we all know that the more people on the trip, the less surfing gets done. Enough room in the cab for backpacks and today’s food and drink – the essentials that can’t get stolen. Enough room in the long bed for everything else, from a gaggle of mini-Simmonses to that Skip Frye 11-footer you’ve been dying to set free of the crowds. Not to mention that dirt bike. And a bicycle, too. White never looks dirty, not that you care. Actually, the dirtier the better. Stock rims that no one will want to steal. A chipped taillight lens, cracked windshield and 3 small dents awaiting many more. Baja and Central America, here we come. Jon and Pete stop in at Suzuki HQ in Brea, CA to freshen up their DRZs and give us the video lowdown. Awesome guys on an awesome adventure – ’round the world sans film crews (Suzuki HQ visit excepted) and support SUVs. Get the rest of the story at toughmiles.com. Getting ready for a surf somewhere between Punta Canoas and the Seven Sisters.